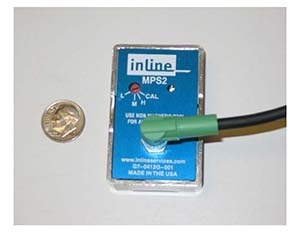 Inline Model MPS2, Magnetic Pig Signalers are designed to detect a magnet molded into an Inline process pig. The detectors are designed with two separate single-axis integrated Hall Effect magnetic sensors, each with an added ferromagnetic layer. The ferromagnetic layer acts as a magnetic flux concentrator, providing very high magnetic sensitivity. Each sensor assembly consists of two sensors, a signal conditioning control circuit, an LED indicator, and a solid state output relay contact all encapsulated in a rugged, aluminum housing.